The Confederation of African Football has approached Ghana and South Africa about hosting the 2015 Nations Cup. 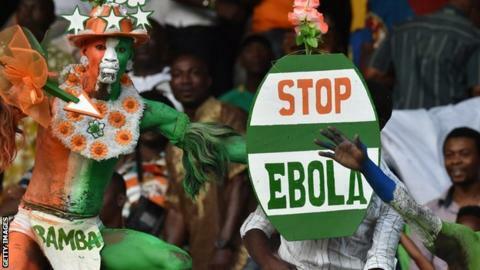 Last week, scheduled hosts Morocco asked Caf to postpone the January tournament because of fears over Ebola. "Caf wrote to us and indicated that Morocco had given strong indications they would pull out if Caf did not change the date," Ghana Youth and Sports minister Mahama Ayariga said. South Africa have been sent a similar letter, seen by BBC Sport. Caf has stated there are no changes to the schedule of next year's tournament and it would discuss the Moroccan health ministry's request on 2 November before meeting Moroccan officials the following day. Speaking in an interview with Ghanaian radio station Citi FM, Ayariga added: "Caf also indicated that it was firm on the tournament dates but they will meet the Moroccan authorities and take a decision at that meeting. "But in the meantime they are writing to a number of countries that they think have the capacity to be an alternative venue… in the event of Morocco actually pulling out." Almost 4,500 people have died in the Ebola epidemic that broke out in west Africa at the start of the year. While Moroccan youth and sports minister Mohamed Ouzzine said on Thursday his country had not withdrawn as hosts, he reiterated that they will follow the lead of the World Health Organisation (WHO), which has advised against big gatherings in the fight against the Ebola outbreak. "Our concern is the health of Africa, and based on WHO reports and guidelines, we have to listen," Ouzzine said. "Zero safety does not exist, but one has to take the necessary precautions so that the coming tournament will be a football feast, bringing together our African brothers, but given the current Ebola situation we don't think such a feast can take place as expected. "We are talking about the Africa Cup of Nations where we are expecting between 200,000 to 400,000, even one million spectators to converge in Morocco. "I don't think there is any state or any country that has the necessary capabilities to monitor, check and control the current Ebola situation when faced with these numbers. "This is our real problem. We don't have a problem with visiting teams, we have a problem with visitors." Ouzzine believes the situation is critical and pleaded for a decision to be taken for humanitarian rather than financial reasons. "If there are fears about the loss of funding and financial commitments, we can always find solutions to these issues - but today is not the day to discuss these things," he said. "We will discuss these things when we meet with Caf - and we might even debate other options. But I beg you, what's the significance of the financial losses compared to human losses? A human being is priceless. "I can tell you that we will reach a definite decision during our meeting with our brothers from Caf."